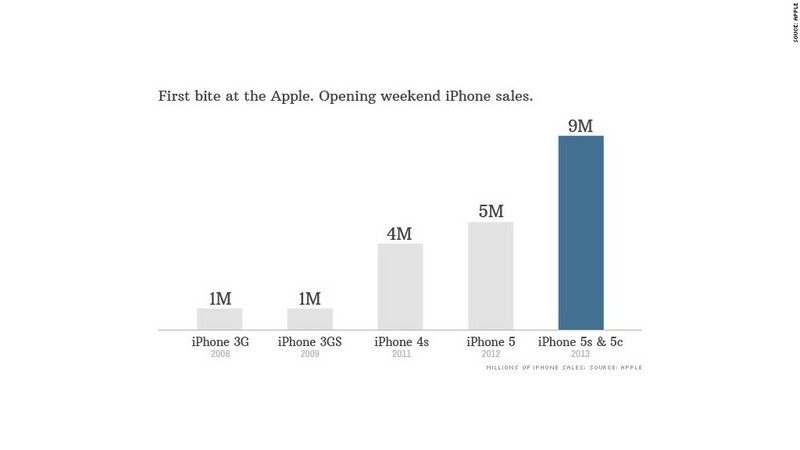 Apple announced it sold 9 million of the new iPhone 5S and iPhone 5C models since they went on sale Friday -- a record opening weekend for the iPhone. That's nearly double the 5 million iPhones that Apple sold during the first three days that the iPhone 5 was on sale last year, and sales were well above Wall Street analysts' expectations. Shares of Apple (AAPL) rose 6% Monday morning. But this year's stellar opening weekend for Apple comes with two sizable caveats: Apple included China in the iPhone 5S and 5C launches. Last year, China didn't get the new iPhone 5 until December. Apple also launched two new iPhones this year, heavily marketing the colorful iPhone 5C. In 2012, Apple only unveiled one new kind of iPhone. The iPhone 5S, which comes in gold, silver or space gray, is available in the United States for a suggested retail price of between $199 to $399. The iPhone 5C, which comes in blue, green, pink, yellow and white, is available for between $99 to $199. Still, the news was very good for a company that has been living under a microscope lately, scrutinized for launching new devices with only incremental updates. Apple said this weekend's heavy demand caused it to exhaust its initial supply of the iPhone 5S. As a result, Apple said it expects its quarterly sales to come in at the high end of its estimated range of $34 billion to $37 billion. The company also said it expects gross profit margins will be on the higher end of its guidance. The new flagship iPhone 5S is similar in appearance to last year's iPhone 5, but it's twice as fast thanks to Apple's new A7 chip. It also has a beefed-up camera that includes slow-motion video and a camera "burst mode" that shoots 10 frames per second. The 5C features a polycarbonate shell, instead of the glass-and-aluminum body of the previous iPhone 5S. The company also said more than 200 million Apple devices are now running the completely redesigned iOS 7 operating system which comes preloaded on the new iPhone, making it the fastest software upgrade in the company's history.